SPONGES! Anyone in the beauty world knows about these by now, and it’s the question of how many do you have and what are you using them for!? My staples are @ALTAIRBEAUTY beauty sponge: I use this for blushes and used the pointy edge for undereye concealer. It’s harder than my beauty blender and works for stipling ColourPop blushes into my cheeks effortlessly. @sauceboxcosmetics complexion wiz works with my cream foundations and cc creams. It’s bouncy enough to blend them into my skin. The carve & bake is my favorite as of late! It’s edge is great to bake powder onto my cheeks and cut or carve my cheekbones after I’ve contoured or applied bronzer. I’ve started doing this as of late since I got this sponge cause it makes it effortless and I don’t have time or skill to do it with s brush (note to the newbie: you do need to blend the powder after you’ve baked! Pls watch a YouTube vid on how to do this I am not to be held responsible if you leave the batcave with white cheeks). The @beautyescapecosmetics stipling is my highliter help. I started using this with the SUPER SHOCK Pearlized from ColourPop and its ribbed for my pleasure texture (Whoah there what was that) and sturdier bounce makes my cp highliters really sink in the skin so it blends seamlessly for a glow from within- maybe she’s born w it type of hack. 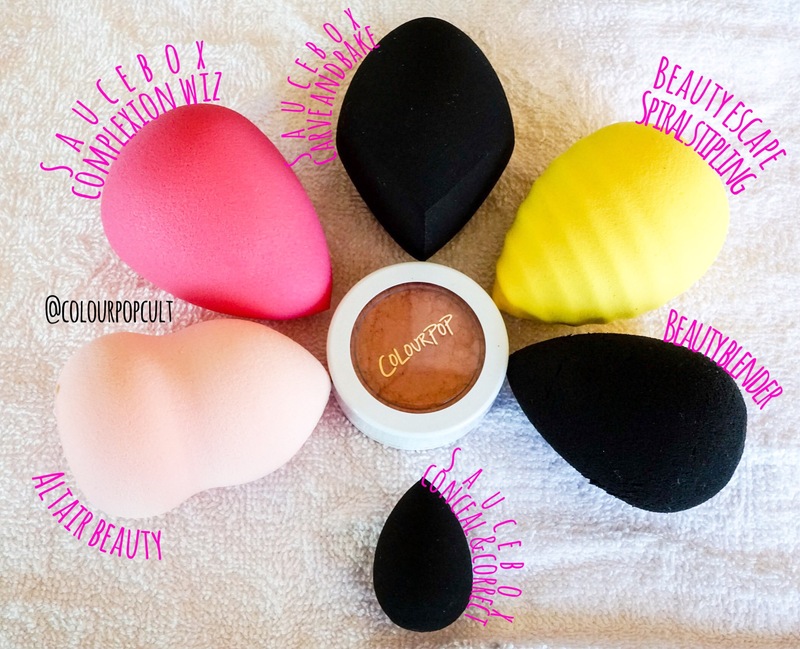 My trusty @beautyblender which is the softer of these, I use for more liquid foundations like when I use @natashadenona or watery foundations like that. The last one is the tiny conceal and correct from saucebox which is your typical concealer sponge for under the eye or the bridge of the nose. I am a bonafide brush snob but I’m not gonna sit here to pretend that these don’t make my life easier with the peculiar texture of my cp goodies – anywho: there are some discount codes below and some of these are doing sales for the weekend- which is your fav sponge out There ! ?